Follow the Huron River Water Trail to adventure . . .
BlogEventsFollow the Huron River Water Trail to adventure . . . I love to explore the watershed and hunt for fish habitat. The Huron River watershed is full of great habitat for a variety of species including sport fishes like small and large-mouth bass, rock bass, perch, steelhead, walleye and pike, and many other unique and diverse species. I like to fly fish the river and some of the larger tributaries for bass because bass are aggressive predators and strong fighters and I enjoy trying to mimic their prey. I am getting better at actually catching them, and our productive river is a good teacher with its wide gentle flow and lots of good hidey holes for big and small fish alike. Mostly, I just like the peaceful time to stand in the flow and take in the sights and sounds of life along the river. Fly fish the Huron River. Now that my kids are bigger, I have started taking each of them along with me. Both enjoy different aspects of the experience. Foster likes to think like a fish, while Ally likes being in the water and perfecting her casting skill. One of our favorite places to fish is along Riverside Park in Ypsilanti. The river is wide there and fairly easy to navigate. We usually start by paying a visit to Schultz Outfitters to get the low down on river conditions and what the fish are feeding on. They have lots of great flies to fill our bait boxes as well. This stretch of the river has LOTS of bass! Most of them are on the small side, but since the RiverUp! restoration project was completed, the guides have been seeing some larger catch. 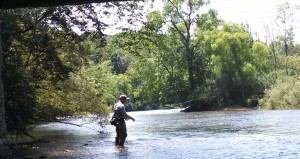 There are other great places to fish along the river. 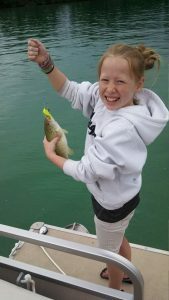 There is really good lake fishing in many of the in-line lakes throughout the watershed, and many river runs near Milford, Dexter, Ann Arbor, and Flat Rock. One of our most memorable times was when my wife caught her first fish while we were canoeing upstream of Barton Pond. She was so excited that she screamed and frightened then 2-year-old Ally. Join me on Sunday, July 15, 2018 for the Huron River Single Fly Fishing Tournament. Pick your best fly and fish it till you lose it. All proceeds benefit the Huron River Watershed Council’s water quality and river restoration programs. Prizes include fly rods, reels, gear, gift certificates and more. Presented by Schultz Outfitters and sponsored by Ann Arbor Trout Unlimited. Register by July 13. Have fun, stay safe with these TIPS from the Huron River Water Trail! This post was originally published June 28, 2016 for Huron River Appreciation Day, sponsored by TOYOTA.